This article demonstrates how to create a Python application that uploads files directly to S3 instead of via a web application, utilising S3’s Cross-Origin Resource Sharing (CORS) support. The article and companion repository consider Python 2.7, but should be mostly also compatible with Python 3.3 and above except where noted below. The main advantage of direct uploading is that the load on your application’s dynos would be considerably reduced. Using server-side processes for receiving files and transferring to S3 can needlessly tie up your dynos and will mean that they will not be able to respond to simultaneous web requests as efficiently. If your application relies on some form of file processing between the client’s computer and S3 (such as parsing Exif information or applying watermarks to images), then you may need to employ the use of extra dynos and pass the upload through your webserver. Please see the S3 Article for more information on this, creating buckets and finding your Access Key ID and Secret Access Key. This guide includes information on how to implement the client-side and server-side code to form the complete system. After following the guide, you should have a working barebones system, allowing your users to upload files to S3. However, it is usually worth adding extra functionality to help improve the security of the system and to tailor it for your own particular uses. Pointers for this are mentioned in the appropriate parts of the guide. An AWS S3 bucket has been created. If you are testing locally before deployment, remember to add the credentials to your local machine’s environment, too. Using config vars is preferable over configuration files for security reasons. Try to avoid placing passwords and access keys directly in your application’s code or in configuration files. This tells S3 to allow any domain access to the bucket and that requests can contain any headers. For security, you can change the 'AllowedOrigin’ to only accept requests from your domain. If you wish to use S3 credentials specifically for this application, then more keys can be generated in the AWS account pages. This provides further security, since you can designate a very specific set of requests that this set of keys are able to perform. If this is preferable to you, then you will need to also set up an IAM user in the Edit bucket policy option in your S3 bucket. There are various guides on AWS’s web pages detailing how this can be accomplished. The user then clicks the “submit” button, which posts the username, name and the URL of the uploaded image to the Python application to be checked and/or stored. If no image was uploaded by the user earlier the default avatar image URL is posted instead. The code also determines the file object itself to be uploaded. If one has been selected properly, it proceeds to call a function to obtain a signed POST request for the file. Next, therefore, write a function that accepts the file object and retrieves an appropriate signed request for it from the app. 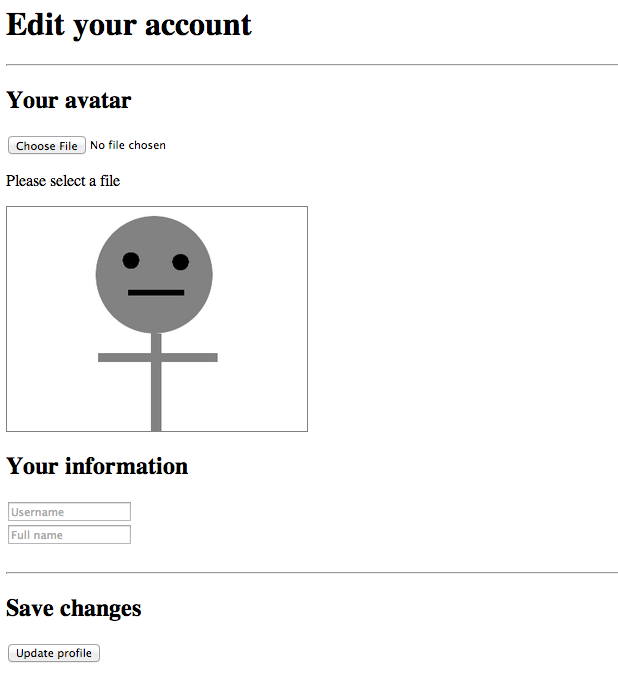 This function accepts the file to be uploaded, the S3 request data, and the URL representing the eventual location of the avatar image. The latter two arguments will be returned as part of the response from the app. The function, if the request is successful, updates the preview element to the new avatar image and stores the URL in the hidden input so that it can be submitted for storage in the app. If you find that the page isn’t working as you intend after implementing the system, then consider using console.log() to record any errors that are revealed by the onreadystatechange function and use your browser’s error console to help diagnose the problem. This section discusses the use of Python for generating a temporary signature with which the upload request can be signed. This temporary signature uses the AWS access key and secret access key as a basis for the signature, but users will not have direct access to this information. After the signature has expired, then upload requests with the same signature will not be successful. As mentioned previously, this article covers the production of an application for the Flask framework, although the steps for other Python frameworks will be similar. Readers using Python 3 should consider the relevant information on Flask’s website before continuing. To see the completed Python file, please see the appropriate code in the companion repository. The currently-unused import statements will be necessary later on. boto3 is a Python library that will generate the pre-signed POST request. This, along with Flask, can be installed simply using pip. Please note that the views for the application will need to be placed between the app = Flask(__name__) and if __name__ == '__main__': lines in application.py. The request is received to /sign_s3/ and the S3 bucket name is loaded from the environment. An S3 client is constructed using the boto3 library. At this stage, the AWS_ACCESS_KEY_ID and AWS_SECRET_ACCESS_KEY set earlier are automatically read from the environment. The pre-signed POST request data is then generated using the generate_presigned_post function. To this is passed the bucket name, the name of the file, some parameters to allow the uploaded file to be publicly readable, and an expiry time of the signed request (in seconds). Finally, the pre-signed request data and the location of the eventual file on S3 are returned to the client as JSON. In this example, an update_account() function has been called, but creation of this method is not covered in this article. In your application, you should provide some functionality, at this stage, to allow the app to store these account details in some form of database and correctly associate the information with the rest of the user’s account details. In addition, the URL for the profile page has not been defined in this article (or companion code). Ideally, for example, after updating the account, the user would be redirected back to their own profile so that they can see the updated information. You will need a Procfile for this to be successful. See Getting Started with Python on Heroku for information on the Heroku CLI and running your app locally. Also remember to correctly set your environment variables on your own machine before running the application locally. 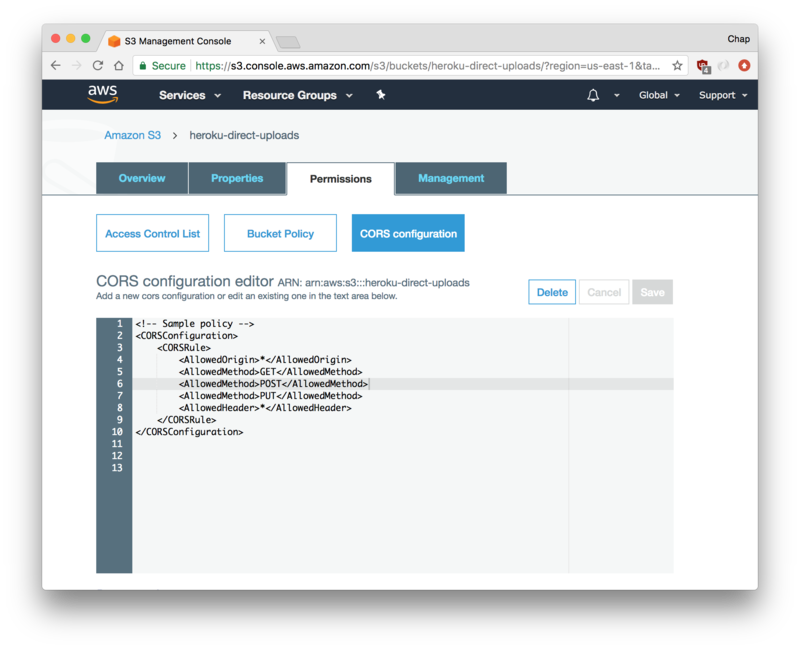 This article covers uploading to Amazon S3 directly from the browser using Python to temporarily sign the upload request. Although the guide and companion code focuses on the Flask framework, the idea should easily carry over to other Python applications.